I've just purchased my 1st metric bike (2018 MT-07) after leaving Harley behind. Love the bike but I prefer the headlight set-up of the FZ-09. 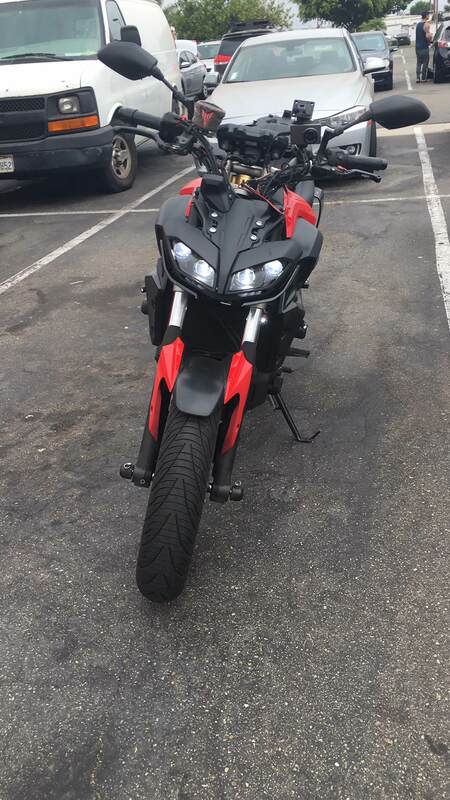 Any opinions on whether or not the 09's headlight system can be adapted on to my 07? Anyone know of this being done and/or can anyone suggest with whom I can check with about it? I tried the search bar in the top right corner but I didn't see where anyone had tried and accomplished that. I only skimmed the first page, you can look yourself, maybe you'll find something. GL! Outstanding....thank you, let me know what you think when you can. It is a bit of a pain. They use different connectors. There is a wiring diagram for an old fz09 going to the new mt09 headlight, it is similar. Yamaha uses a 6 pin connector on the new mt09 headlight, where the fz07 uses a 3 pin H4 connector, plus separate wiring for the running lights. Finally got it wired up correctly. Post with 48 views. Finally got it wired up correctly. Here is a diagram of the wiring. The running lights may not be the best 12v to grab from. Not sure if the fuse can handle the extra load.